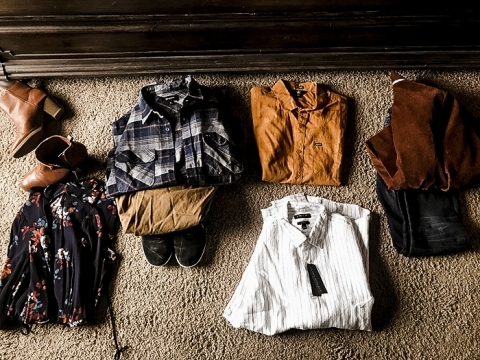 Are you looking for inspiration for the perfect clothing options for family portraits? My clients often ask me for suggestions on clothing attire ideas when preparing for their engagement session and family portrait sessions. Gone are the days that you have to stick with all one color, such as denim and white shirts or beige pants and white shirts. 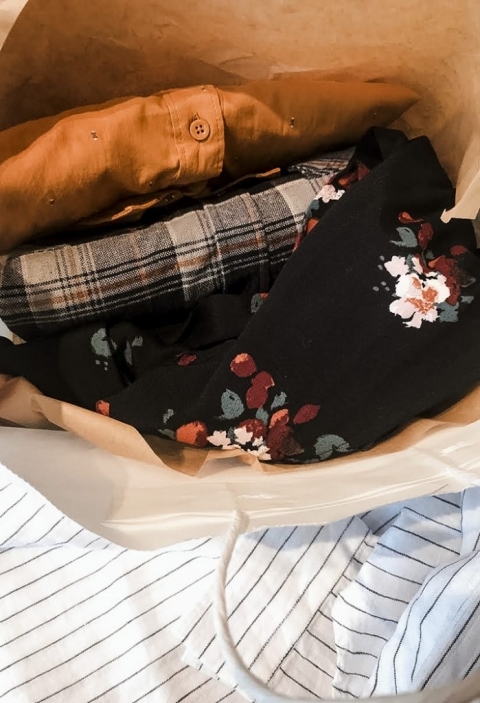 While that style is classic and timeless and always photographs well, it’s okay to mix up fabrics, colors, patterns, and prints as long as the colors and patterns are cohesive together. How do you choose a pattern or color theme for your portrait session? Typically I would recommend sticking with no more than 4 colors within a theme. 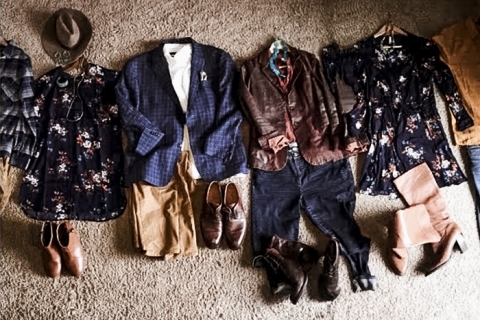 If you want to mix patterns, choose your favorite clothing item with a pattern first. 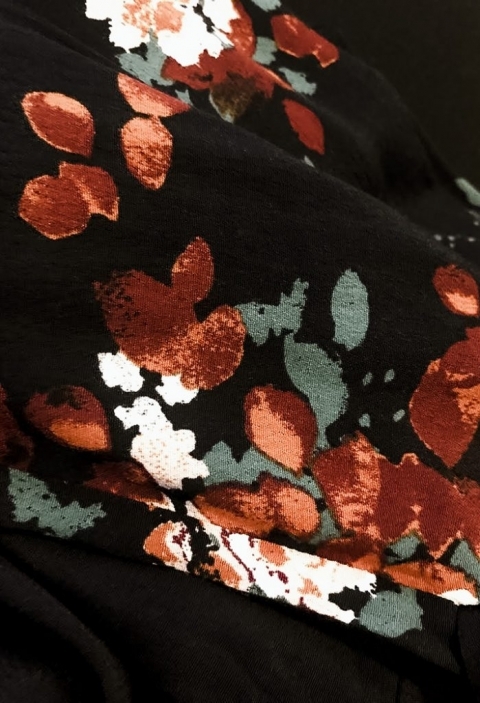 It can be floral or any fabric with a pattern that will include 2 to 4 different colors within that pattern. Once you have your favorite pattern chosen, you can then base all other outfits off that color pallet within the pattern garment. Base your entire coordinating outfits off that one favorite garment. This will set the style and tone for the rest of the family when choosing the attire. What color theme should I choose? What location have you chosen for your photos? What is the color pallet of the background location you chose? You will want to stand out in that environment. What does the decor in your home look like? For me personally, I want the colors of the attire and backdrop to fit in cohesively with the environment that I plan to hang the photos in. What skin tones, hair color, and eyes do the individuals have in the shoot? What colors will be most flattering for your people? If this is for engagement photos, what are your wedding colors? Do you plan to display these images at your wedding? If so, do you want the colors to match cohesively with your wedding color theme? For example, while planning our own personal family portrait recently, I found a dress for my daughter that I absolutely loved. The colors within the dress would look really great with my daughter’s skin tone, hair, eyes and I knew she would love the style and trend of the dress. Once I chose this dress pattern, I began to look for all other items based on these colors. We have 6 people in our family, so I chose all three men to have a line or plaid type of pattern in either their shirt or jacket. A subtle line with the same matching colors. Both of my daughters wore the same pattern and color dress in two different styles. And one of us wore only solid colors. During the photo shoot, I had the photographer mix and match us as a family so that when we all stood together everyone was a little different with style, yet keeping everything looking cohesive and we all stood out in the photo in our own way. No one stood out more than the other, we all blended in nicely together, however keeping our own individual style. (Here are some iPhone photos I quickly snapped just prior to getting dressed just to show you how I tied our clothing style altogether. Don’t be afraid to accessorize with fun colorful jewelry, hats, scarfs, unique shoes that are trendsetting and add a little more character and individual style to your shoot! Beware of large watches, sometimes if it’s a beautiful sunny day, bright light will reflect off the watch causing sparkling spots of light to the flesh, face, and arms of the person standing next to you. Also… if you want to show off your spouse’s jewelry and wedding ring… sometimes watches can distract from the jewelry you are wanting to show in the images. Several items we already had for years! I hope you find this post useful for the planning of your next photo shoot. I will share that I think Pinterest is an incredible source for inspiration of just about any trend or style and I refer to pinterst all of the time. Please let me know if you have any questions, I would be happy to help! Happy planning!